This week was about shifting my systems and routines a little bit in order to support more learning. 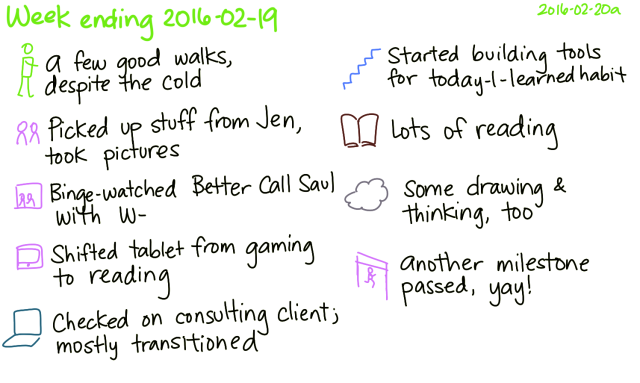 I’ve been thinking about how to build a regular today-I-learned habit as a way to keep myself moving forward a little bit at a time, and have been putting together little tools to make it easier for me to discover and share tidbits. After reflecting on the various games I’d tried out on the tablet, I uninstalled a whole bunch of games that weren’t tickling my brain the way I wanted. I might keep Rising Super Chef around because I like the time management aspect, although I’d also be up for something with less randomness and either more skill or more humour. Possibly some kind of a word or math game, too. Anyway, I’ve been shifting towards using the tablet for reading Toronto Public Library e-books through OverDrive, browsing the Web (especially for answers to specific questions), and watching videos on Youtube. I managed to go on a few long walks, despite the cold. I got through quite a lot of reading on the Kindle, too. I need to refresh the selection of items I have on it since I’m at the end of the fiction I’d lined up, but I can always go through the manuals for Emacs and Org Mode. It was the fourth year mark for my 5-year experiment in semi-retirement, too, so I’ve been putting together a review covering the past year as well, an overall look at the past four years, and plans for the next year. It’s been a good year and a good experiment so far. It’s hard to imagine a better way to prepare for the next step. Milestones, yay!